50x60 fleece blankets. 100% polyester, anti-piling, with complimenting back whip stitching. Price includes 5K stitches of custom embroidery. 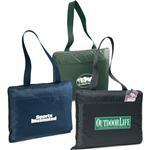 A great sports promotional item for that cold game day to be used for gifts or as a fundraiser. 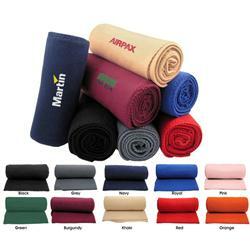 Available Colors: Gray, Black, Navy, Royal, Pink, Green, Burgundy, Khaki, Red and Orange. 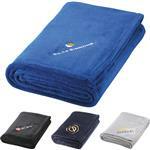 These are lightweight, around 13.5 ounces per blanket.